Why can mesmers insta-down people? I play an old timers condi build mesmer and I fought a warrior today that just kept cleansing everything I threw at him. Many of the new builds are just crazy. By the way I have no idea what an insta down build for mesmer would be? Is it on the meta? "Love thy enemy, for without them there would be no WvW." Ironically, Dragonhunter counter Full Glass shatter Mesmer. they cut through tougness like a hot knife through butter tho. same with dagger thieves. I think the common theme of frustration comes from folks that feel one shotting should not be an option for anyone. Many people want the chance to make a mistake or 2 and have a chance... even if you lose because the other player was a bit better. When you introduce a system where a player can be decimated unless they have super twitch reflexes the complaints are gonna happen. "I´m not big on sermons, Broken bones teach better lessons." A deadeye can just stealth for half a minute (i cannot throw around AoEs to hit him while he's stealthed for so long; i'm wasting cds and cannot just geuss where he went; there is no counterplay here, don't pretend there is) and then he'll ACTUALLY oneshot anyone. Not some combo you can avoid if you dodge after the first half of a milisecond, but just a straight up oneshot. I tried going full toughness and then he just does some other pew pew skill and i die or he stealths again immediately. 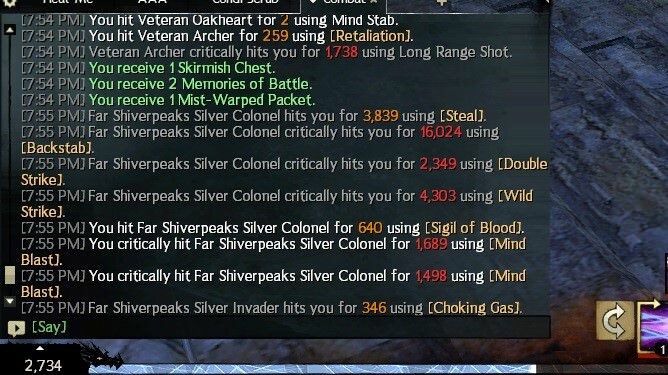 Imo deadeye is worse than mesmer, but both are stupid for wvw/pvp. I just tested a full burst with an ele. That one shot ele build is real. And it hits way harder and faster than power mesmer. I could only barely brush against the same kind of effect by using food and full glass traits and gear. He was not on full glass gear. Mesmer on paper and base stats is not as strong as most other classes. The one shot from stealth trick is nothing but a trick. If an opponent has been aware of the mesmer running up and then popping their 3 second stealth not from too far away or just being alert in general ready to pop an evade or blocks, they wouldn't have a problem. I have only bursted a very few people honestly. Most avoid half the damage and it's purely the full power stats that can manage to put on enough pressure to win a fight. 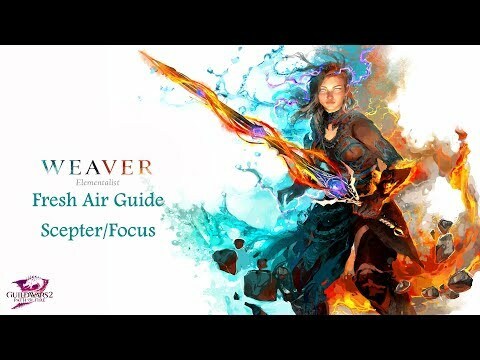 Mesmer can only stay alive by using their evades and stealth and clone tricks. That's all there is to survive if we want to put out that kind of power damage. A LOT of classes can one shot. And a LOT can also get away with it or die trying just like everyone else. I play a mirage that can pretty much insta-kill glass and I fought a warrior the other day I couldnt get below 75% hp before he had outsustained and killed me (the fight lasted several minutes). That was a stock warrior. And it happened after I had roflstomped a spellbreaker. Many of the old builds remain crazy. Why is there not much talk about this? Instant kill abilities with no counter-play should not exist in a game. There should be skillful counter-play to everything. Right now, a mesmer can instant down you from stealth and there's absolutely nothing that can be done about it. You don't see it coming as there is no animation or sound warning. We ran a test and my buddy can hit my warrior with 1400 toughness for 24k damage instantly with no animation from stealth. Auto endure pain doesn't even kick in on time. Any other class with less health dies instantly. Where's the fun in this? Honestly, it's only fun for the mesmer and is that good for the game? I gave it a shot on my mesmer and I can teleport onto 3 people and instantly down them all from stealth. Most huge damage abilities in the game have obvious telegraphs. You can dodge deadeye's big damage because you see and hear an obvious projectile. You can see a killshot from a warrior coming because it's obvious. There's counter play to all of these. Is this getting nerfed or what? I don't mind being outplayed in duels and small fights but being instantly downed out of nowhere feels like you're cheated. People that run these types of builds are usually too scared to fight you head on and the only enjoyment they get is to be toxic to other players cuz they feel so toxic themselves. After all, if you lack any real skill then use whatever overpowered and unbalanced options available. LIke the vault spamming thieves, the constant invulnerable warrior with heal sig, the condi spamming necro etc. Funny that people now complain about 1Shottie Mesmer because that build exist since months. In WvWvW it is even more lul and it getting more popular now. First video thief wearing zerk instead of marauder. lol balouga prob the biggest piece of ..... in this game. People that dont run these types of builds are typically too scared to leave the zerg, so it balances out nicely. DH counters mesmer pretty hard, if the DH saw the mesmer they can use F3 or shelter to block 60-70% of the shatter burst, F1 the mesmer and they’re dead as they can’t stealth. A glass mesmer or any mesmer that could one shot a marauder DH will take 2.5-3k from the auto attack LB alone, traps, F1 pull, smite condition (DH will have vuln from unblockable mirror blade) and a lot of other skills can essentially burst down the mesmer. In a protracted fight they cleave clones far better than most classes with procession of blades, sword and even most LB attacks will annihilate clones. Only the phantasms might live longer on shield phantasms but even they die quite easily and that’s assuming your part of the 90% of the population that never dodges the shield phantasms summon. 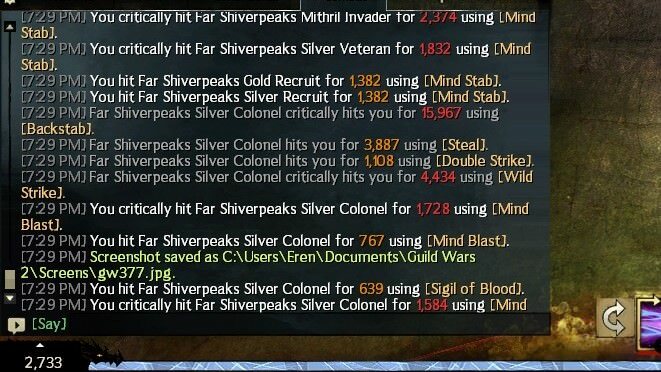 With spellbreakers and scourges running around I think we have bigger problems than mesmers in wvw. I have never been one shot by a mesmer on wvw. If someone run full zerker schoolar mesmer they would still need to waste 2/3 utilities to stealth, teleport to melee range and produce 3 clones to shatter on you. If that fails they are dead. Yeah, because necros are so unwanted and uneeded in WvW. Do not confuse your objective opinion with that of objective fact. Remember, what you say matters, not what you meant to say. Does that mean you also don't like the ele build and want it nerfed too ? Cause I havent seen you post about it either? You don't defend a broken build by setting another broken build as an example. And you can't even roam with that kind of weaver build for God's sake nor does it have any defensive capabilities that Mesmer has. Yes, in a protracted fight the DH will win. But the Mesmer can avoid this by one-shotting the DH from stealth before he even realizes there's a fight. I'm just wondering why I don't see more post from you asking for other broken things to be put in line, yet you targeted mesmer. I wonder why? FA ele is able to burst people down, in an environment of controlled variables. Yet no one, including you, talks about it. Why? Where is your thread about it? I'm honestly curious, why all of a sudden, after this combo has been in game for a little over a year, all of a sudden. People start pointing fingers at it? What class do you play that has led you to be this vindictive? Because Mirage gave defensive tools Mesmer didn't had before. It reduced the risk of playing full glass, while even making the entire shatter combo easier to do with the addition of Jaunt and Self Deception. the addition of jaunt gave the mesmer which has a static dodge the ability to move in the omni directional paths that normal dodge would have originally have let you. and a double ( triple or quadrople depending on the situation) stun. What mirage brought was a sword leap that lets you run away a lot easier, that I wont debate as it's already been proven. Meanwhile mirage is somehow one shotting guardians "with no animation". Do you even read your own posts? What are you saying? I just said all similar builds need to go which literally includes all classes in case you don't understand. Also, you posted a SWORD/DAGGER WvW video in which I said it's not even viable for roaming. Now you use a SCEPTER/FOCUS structured PvP video as an example wherein only Warrior uses an amulet with Toughness in its meta build. Heck, core FA Ele is even more used and viable than FA Weaver in sPvP. Are you that scared for one shot builds to be removed that you can't even understand the context of what I said? One shot builds need to go regardless of class. these people are complaining because they are the type of person that cannot adapt and over come, point out flaws in their arguments is pointless because they only see what they want to see. Madness Rises [Rise] Of Gunnar's Hold, represent. So...where's your thread about it though? Limit crit to 100 % anything from stats gain, above that needs to be provided by boons and food. My opinion is already posted here. Do I need to create multiple threads for every single one shot build and whine there about the same thing? Let me ask you instead. Why do you think this Mesmer build and other one shot/multi-hit spike builds (that can one shot in a sense) currently out there shouldn't be touched when its predecessors got nerfed? Lol, since when? Which game are you playing? Necro. Never knowingly blasting combo fields since 2012. I havent said one way or the other that I do or do not think they should be nerfed or not. Usually when people want something to be nerfed they crusade for that one build with little to no accurate information while simultaniously forgetting other builds on different classes that can also achieve the same damage. When people want a class to be nerfed they do exactly what you did, post first that " hey class x is too strong and it needs to be nerfed" and " I dont like any class that does X damage" and when the class they want to be nerfed is finally nerfed..
" And yes I don't think one shot builds deserve any place in PvP or WvW, "
or are you just another crusader who has trouble so you want things nerfed for you? As for my opinion personally at this point, I don't care either way, I already know of this communities hate for all things mesmer, and a lot of people are not happy until dealing with mesmer is an after thought. They all alternate at some point or another. LOL why do one shot builds need to go? It doesn't make sense. Who's going to deal with insane sustain roamers then? If one shot builds which is power or condi spam burst builds don't exist, no one can pressure and put down a heavy sustain 1vX roamer that exists even outnumbered and I encounter them all the time. That kind of damage is necessary to balance the other extremity. If you don't want to face one shot builds, either build for sustain, because there is basically no way for any of us to one shot a tanky warrior or necro or guardian etc. or you can stick to zergs. Also you get one shot in zergs anyway due to siege and overlapping aoe sometimes. So what's the problem with learning to deal with one shot damage either as a group or solo roaming if you want to roam? And seriously it's not that hard to deal with one shot classes. As a full glass player of various classes I've been one shot like... twice when I wasn't fully aware of my surroundings. So you never actually answered the question as to why the current massive spike builds deserve to be retained while its predecessors got the nerf bat. All I understand from what you say is you don't really care, you're just salty because Mesmer is targeted even though I've stated that every similar builds should get the same treatment. I have not been deliberately targeting Mesmer alone. It's not like I even agreed to what others have said which are obviously not the reason why this build is overtuned, I only agreed that this specific build needs to be toned down. I even listed previous builds that were essentially the same (press multiple buttons for a massive burst in an extremely short amount of time). If you want something that was obviously the biggest L2P issue regarding one shot builds, it's actually the classic Bull's Charge -> Frenzy -> 100 Blades Warrior where in you only need to dodge Bull's Charge OR use a single stun break and then evade. Builds with insane sustain that can still deal decent amount of damage or even have access to burst damage is another set of problem that needs to be addressed. But the previous stance of Anet about massive spike damage that leaves very little time to react has been the same (though they're haven't been fully consistent with it with thieves). As we push to improve balance in both PvE and PvP, a few mechanics in the game will be receiving updates to promote fun and balanced play. In the past, quickness has granted double the action speed normally available to players. In PvP, this speed gives most players almost no chance to react to incoming abilities and allows for massive spike damage in extremely short periods of time. Below is from an older State of the Game video regarding 100 'Nades which is highly similar to the current one shot builds. Karl: People would just run up and, say, swap to grenade kit as they're throwing a grenade barrage and... there's 24,000 damage. It's not like I'm saying anything new. I've just been saying that Anet should what they have been doing - remove builds that does a massive amount of damage in an extremely short amount of time with little to no time to avoid. I've also played FA Weaver and it's damage is ridiculous. It actually has 2 bursts rotations centered around Plasma Beam and Earthen Synergy (which has a stun as well to go with the massive damage). It's less talked because one shot mesmer builds are more prevalent right now but I believe it's the same issue as this one, massive damage in a short amount of time, so it needs the same treatment. Leaping straight into the middle of a zerg just because you had to dodge and had someone targeted is not the ideal solution to the age old issue of "I should really run away from this zerg". Nuh, uh, why can any toon do this to another? Skills that can't be cleared with four separate condi clears are not OP, they are abusive. Although i do play also a mesmer i think they should remove all 1 shot / insta burst builds across all classes *thieves, mesmers, barrage rangers, fresh air eles & so on, and icrease survivability of all. When video is posted of these one shot builds downing full exotic builds with toughness. And put them up using the so called hated trailblazer or dire. Show me them one shotting medium armor or above with those armor types. I run 2300 armour and -10 Inc dmg and still get 6k mind wracks. A fellow guildy runs marurder reaper (27k) health and that got insta bursted. What i mean is these 1 shot builds should be removed & the tanky builds who deal tons of damage also. Both of which promote skillless play. 1shot builds because they rely on not giving reaction time to the oponent. Tanky heavy condy builds because they take away every option from the oponent. So in conclusion combat should be longer to give all sides more equal opportunity. So... toughness can't go beyond a certain level? You say removed, and I know you inherently mean the condition damage stat line from Dire and TB, but then is apothecary OK? Is it the toughness number itself? There are starting to be counters to full dire and TB with the removal of boons. The only thing that has made these builds OP now, is that their boons can be stripped and corrupted. Because most of these builds were available pre PoF, they just weren't viable. DE being the notable exception. People didnt notice it until all the boon hate. In general there sbould be much better balance between sustain & damage, as they currently are extremely imbalanced. What i meant by "removed" were the whole broken play styles of extremely overbuffed aspects. (a combining factor of defensive stats to offensive stats [and skills]). This should have been common sense to the devs when making tha game. Also HoT with the 4 stat item sets pretty much kitten everything up. Somewhere something went terribly wrong in ANet hq xD & the consequences are that everyone now is much more uset. You know dire fit into the second category right... so it would still have been messed up lol. I don't consider any kills from these one-shot builds as even counting, nor do i view it as I was outplayed. In fact, I have 0 respect for anyone that uses them. This is a prime example of letting a build carry a crappy player. I've seen this build alot the last few days. All these crappy players do is go for the one shot, and if it fails, they are totally clueless on how to survive. Most try to run away (to try again i suppose), and they are easy kills. Some try to kite around like a chicken with their heads cut off while their kill shot is on cd. Those are the funniest folks to watch. That this play style exists is a testament to human behavior. There is a subset of folks that cannot compete in a 'balanced' match. They turn to cheese builds with low risk/high reward (one shot/run away), some turn to using exploits, etc. I feel sorry for them to be honest. But hey, if its the only way they can compete, more power to them. Yeah but they should lower its condi dmg stat in this case, because power builds need also crit & ferocity while condy even without expertise is still pretty kitten good. & that is exactly why Anet needs to balance the hell out of this game if they want to keep tgeir customers (happy-content). I feel the same way as you. 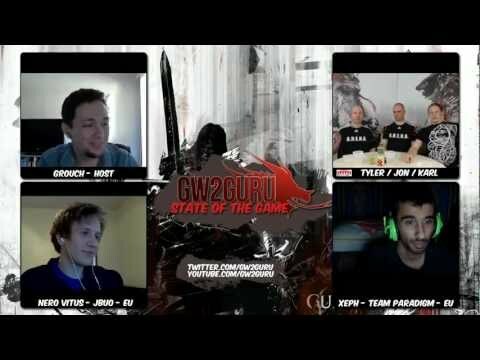 Every day i meet such cheezy builds in wvw & most of the times i win but whe i lose i get bitter not because i lost, but because i know that guy is inferior in skill & just exploits a broken mechanic. When i finally managed to almost down him after i killed the sb, he just ran for the hills like there was no tomorrow xD. Can you immagine how bad these guys must be & they obviously knew it & roamed in a party because of that xD hhahah such pitty. What you're talking about here is a result of power creep from the expansion elite specs especially. though core also had one shot, I actually remember it being better for roaming years ago. I don't think they can just reduce damage because anets real problem is trying to blur the gaps between the three game modes PvP wvw and pve. If you nerf damage across the board pve will suffer. And they seem reluctant to just make changes for PvP and wvw. Other thing is the elite specs get more powerful or versatile. Their design for tempest or scourge to be a support spec basically backfired and somehow they are the ones with most damage. Their design for versatility for the whole game is not at all possible to balance. There are all sorts of complicated entangled problems for the whole game when you dive into the subject. It's not just a matter of simply removing one shot builds. One shot doesn't come as a separate build. It is the culmination and enabling of how a player wants to build something with all of these factors. For example use of full zerk glass gear while using all offensive traitlines and sigils and runes. If you nerf base damage then everyone will have no choice in their trait lines and gear in order to deal enough damage. The sustain end of things is also due to specific player choices. What you're talking about is anets design and also removing of player agency. I agree that for example in demo weekend with the deadeye even without glass gear or full design I could still crit 30k shots with one hit and not too much time. That seems to be ill designed. But if someone chooses to fully invest as full glass to do a 30k one shot then that becomes player choice. There is a power creep ongoing. I think the only way to deal with it really is to increase everyone's base health pool stats so it's harder to just one shot. And it also makes sense with pve bc pve content in expansions and endgame gets increasingly more difficult. Well, if they increased every classes base health pool by 20k in WvW, to account for the power creep over the years, that should alleviate one-shots, as well as offset some of the ridiculus condi bombs. I dont really get whats all the stubbornness about not wanting to separate the skills, when that's clearly what must be done to better the game. I have a feeling the modes are too intertwined. Probably creates way too much programming to separate the modes. If this scenario actually happened, which is incredibly doubtful, your average player would not be complaining. They would be happy with the outcome of an outnumbered fight. Stories like this scream "I lost, but I'll pretend like I was winning, yet for some reason still complain."